This marker is located at 1430 US Hwy 395 N, Gardnerville, Douglas County, Nevada. There are 17 other historical markers in Douglas County. 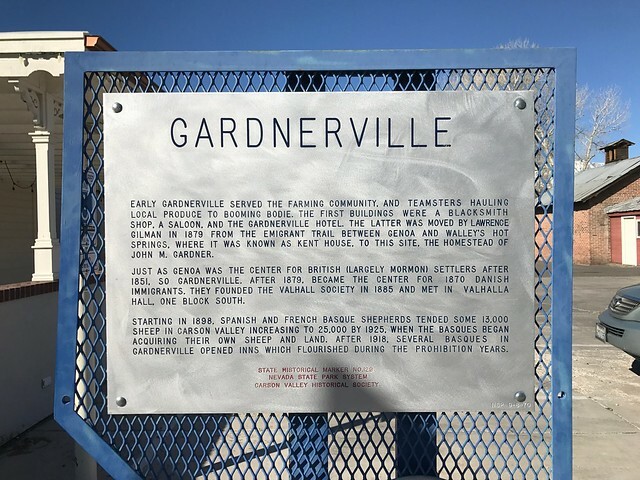 The GPS coordinates for this location are 38° 56' 26.7" N 119° 44' 55.8" W.
Early Gardnerville served the farming community and teamsters hauling local produce to booming Bodie. The first buildings were a blacksmith shop, a saloon and the Gardnerville Hotel. The latter was moved by Lawrence Gilman in 1879 from the emigrant trail between Genoa and Walley's Hot Springs, where it was known as Kent House, to this site, the homestead of John M. Gardner. 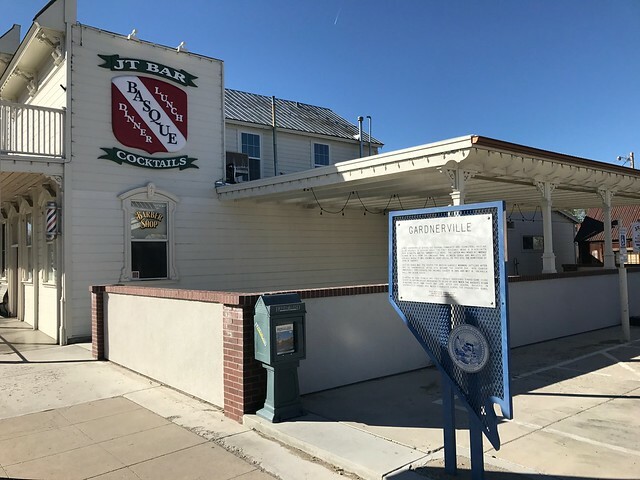 Just as Genoa was the center for British settlers (largely Mormon) after 1851, so Gardnerville, after 1879, became the center for 1870 Danish immigrants. They founded the Valhalla Society in 1885 and met in Valhalla Hall--now gone. Starting in 1898, Spanish and French Basque shepherds tended some 13,000 sheep in Carson Valley, increasing to 25,000 by 1925, when the Basques began acquiring their own sheep and land. After 1918, several Basques in Gardnerville opened inns which flourished during the Prohibition years.